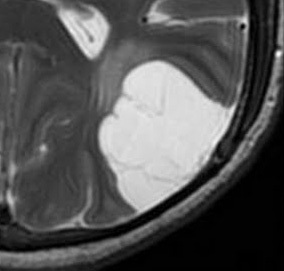 Long T1 materials are dark on T1-weighted images, but long T2 materials are bright on T2-weighted images. And vice versa. Why don't these behave the same way? 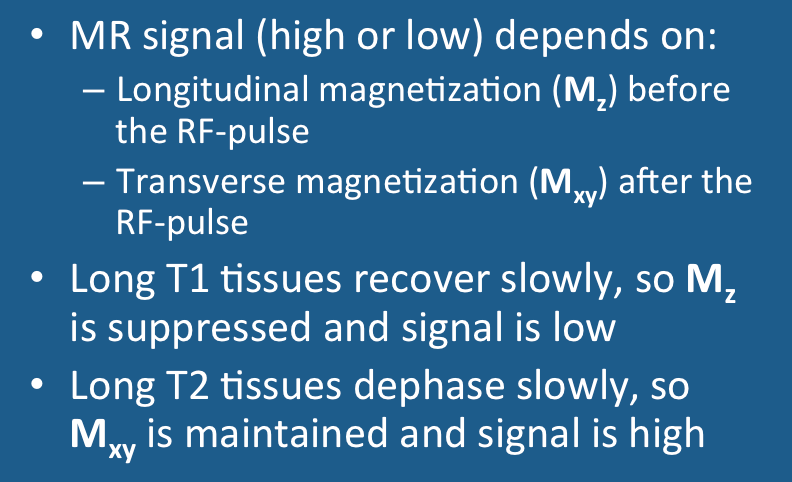 The size of Mz, the z-component of tissue magnetization (M) before the RF-pulse. The size of Mxy, the transverse components of M after the RF-pulse (when the signal is recorded). T1 reflects the length of time it takes for regrowth of Mz back toward its initial maximum value (Mo). Tissues with short T1's recover more quickly than those with long T1's. Their Mz values are larger, producing a stronger signal and brighter spot on the MR image. T2 reflects the length of time it takes for the MR signal to decay in the transverse plane. A short T2 means that the signal decays very rapidly. So substances with short T2's have smaller signals and appear darker than substances with longer T2 values. The above discussion presumes we are dealing with a "standard" magnitude-reconstructed spin-echo image. The same conclusions and observations would not necessarily apply in other situations, such as if the sequence were a phase-sensitive inversion recovery one, for example. Elster AD. An index system for comparative parameter weighting in MR imaging. J Comput Assist Tomogr 1988; 12:130-134.